SPACE SHUTTLE UPDATE: The threat of Hurricane Dean closing mission control in Houston has prompted NASA to recall Endeavour to Earth one day early. The shuttle undocked this morning at 7:56 am EDT and will land in Florida on Tuesday: more. 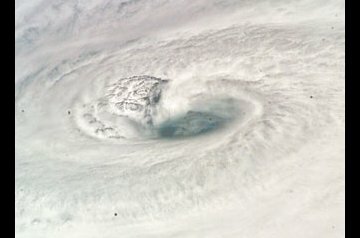 Above: The eye of Hurricane Dean, photographed from the ISS. Readers with backyard telescopes, try targeting the ISS as it slowly glides across the sky. You can see solar arrays, laboratory modules, living quarters and more; browse the images below. ISS images and video: from Stefan Seip of Stuttgart, Germany; from Tom Gwilym of Renton, Washington; from Ralf Vandebergh of the Netherlands; from Hanno Falk of Flensburg, Germany (cross your eyes! ); from Dirk Ewers of Hofgeismar, Germany; from Mario Weigand of Offenbach, Germany; from Alberto Zampieron of Italy. SUN HALOS: "I'm a fan of sun halos! And little by little, this passion has intrigued Lydia, my 7 year old daughter," says Laurent Laveder of Port Navalo, France. "Yesterday morning, I lent her my sunglasses to let her see a nice circumscribed halo. As I was in front of her, explaining her what she was observing I noticed the halo reflected in the glasses, took my camera and snapped." Click here to view more of Laurent's pictures. "In the lower part of this picture, you can see a photo taken one minute later showing the halo itself. 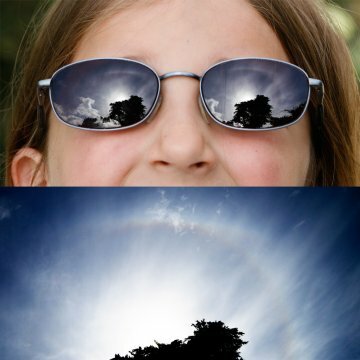 This picture has been left-right reversed to show the halo as its reflection in the glasses." Photo details: Canon 30D + Sigma 70-300 lens at 70mm (for the portrait) and Sigma 10-20 lens at 10mm (for the halo). On August 19, 2007 there were 878 potentially hazardous asteroids.